From Tapawera the scenic highway continued, then turned inland to St Arnaud. Despite looking like it should be a busy road, the vehicles were few and far between, but the dramatic valley views and snow capped mountains of the distance took our attention. Our roadside lunch stop was boiled eggs and asparagus, followed by fruit, just incase you are concerned about us getting our greens. As we neared St Arnaud we were passed by several army vehicles and tanks all heading to the lake for a mission which was rather exciting. The little town was much like an alpine ski village and the snow was in sight, albeit higher than we were. 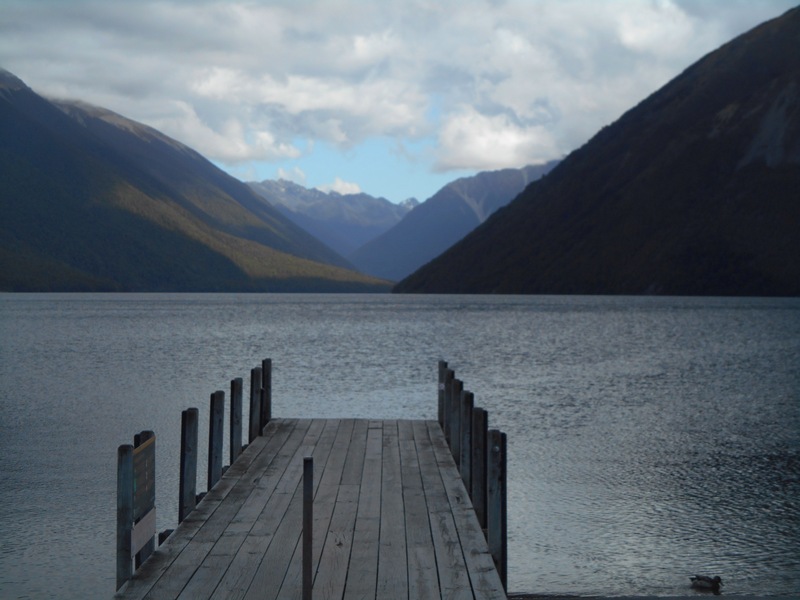 We stopped at the cafe with very generous portions of cake, before making camp at Lake Rotoiti, our view, a vast volume of water with steep mountains in every direction. We walked along the pebble shores of the lake, stopping to skim and observe the many bird calls. In the morning the clouds hung low around the lake meaning our plan to climb the mountain for a lookout was put off. Instead we headed back to the cafe to watch the drizzle from indoors with a slice of cake. Around 11am we set out for our easy days riding, 25km of gradual downhill to Kawatiri. We made it in time to set up camp early and unload our luggage. 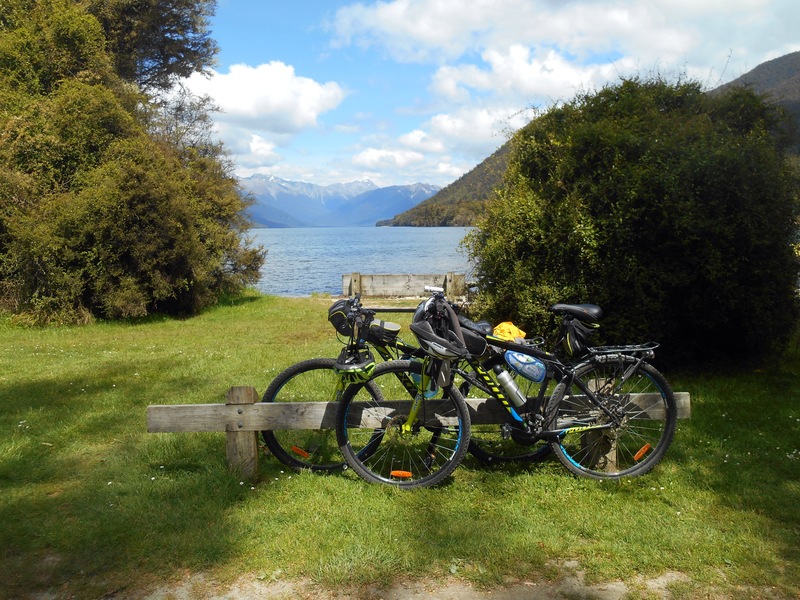 We cycled to the other lake which is part of the Nelson Lakes National Park, Lake Rotorua. By doing so we almost doubled our days cycle just sightseeing, but the sky was much bluer overhead and when our winding country road revealed the lake, the view was once again of spectacular beauty. 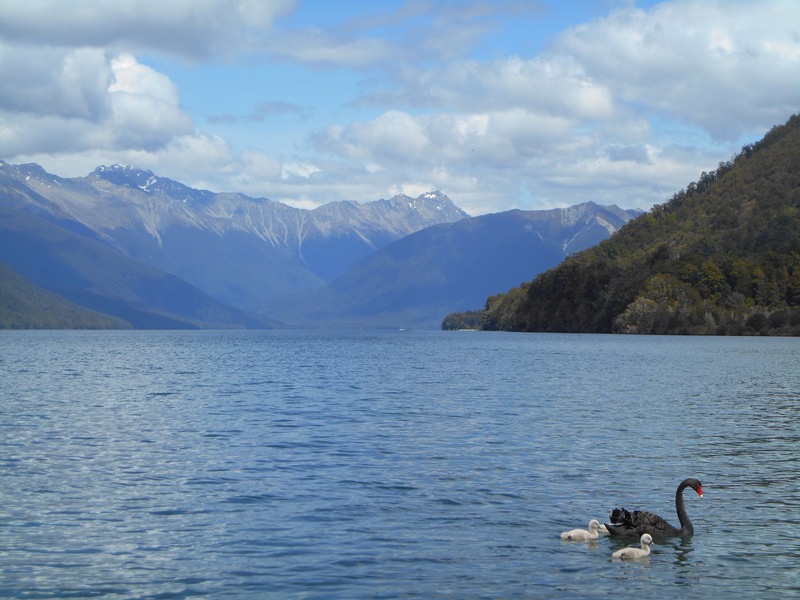 We sat on the jetty looking out, joined by a family of black swans with signets and unfortunately, a lot of Sandflies which probably cut our stay short. As we wound back up the country lane, we searched for the ice cream promised by the road sign, only to be disappointed. We were camping at the old railway station, now redundant. 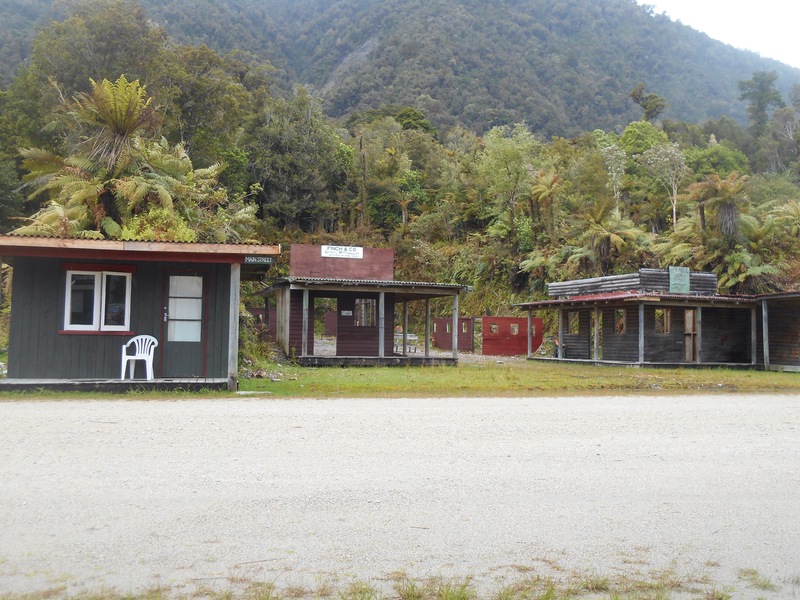 Kawatiri used to be a hub of workers and their families building the vital link from the west coast to Nelson and beyond. Today there isn’t a single resident, it is just a junction. The railway was abandoned with a gap only 42kms from joining up the entire South Island and so this place remained cut off. We made our dinner under the shelter and were in bed early to hide from the wind so resorted first to doodling and hangman and then to me reading Aladdin to Alice out loud from the Arabian Nights. Memorable because: where are all the people? Our bus picked us up from our beds practically and we were relieved to haul ourselves onto the bus, more relived than the driver was to see us with our bags and luggage. We soon won him around and he gave an interesting commentary of our trip out to Westport and down the coast. We made an important cafe break which perked Alice and I up, before following the course of the Buller River and out to the old mining towns. The West coast used to be thriving with life as the gold rush brought people from all over, keen to make a quick dollar. Now this 9% of the country has just 1% of the population. Many towns rely on coal mining and farming, both on the decline. The coastline was rough, the waves fierce looking, the road following a windy path round the headlands, sea to one side and greenery and forest to the other. It was vastly different again from the landscape so far, untamed in every sense. 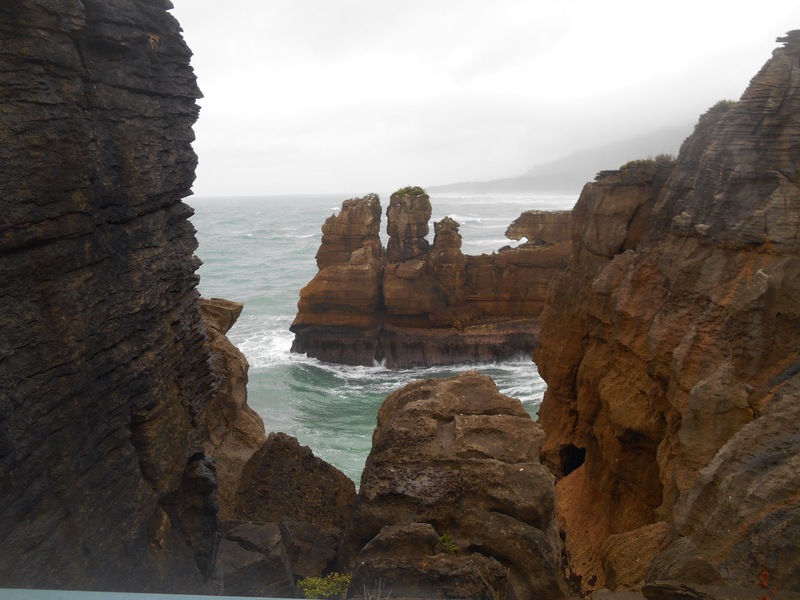 We were supposed to alight in Punakaiki where the bus made a 30min stop, however with the grey cloud hanging low and drizzle threatening to turn heavy, we told the bus driver we would accompany him to Greymouth. 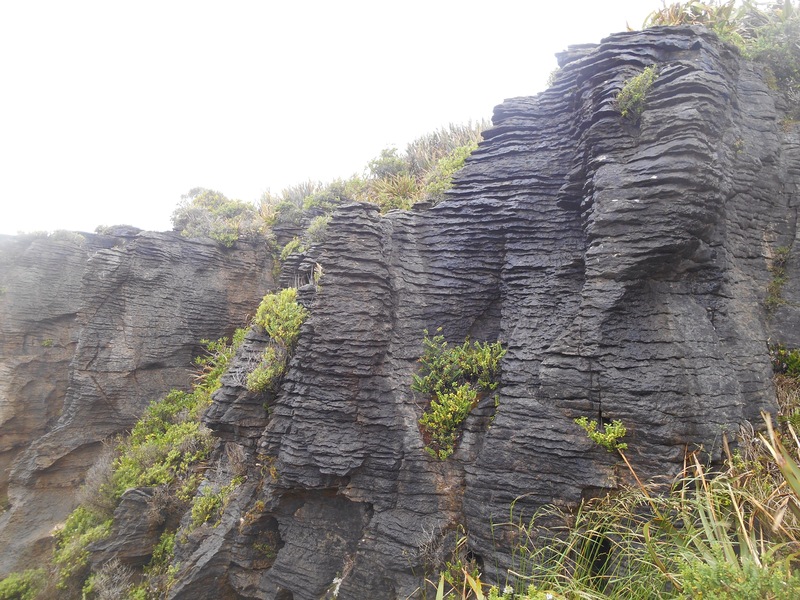 Punakaiki is otherwise known for ‘pancake rocks.’ Quite out of nowhere these jagged limestone rocks define the coast, all marked horizontally so as to look like a stack of crepes. The strong water surges through the pools, particularly in high tide when this area shows it’s full force. In Greymouth we did our rainy day routine and went to the cinema to watch Hunger Games. It was a small town cinema and the film had to be started as the film froze. On a Friday night in Greymouth, the evening surprisingly more perky than the afternoon, there was still no one to be seen! Our morning started with town chores to prepare us for our long stretch into Queenstown. We had laundry to do at the local launderette and we both needed new back tires to replace our bald ones. This done, we procrastinated by drinking coffee and exploring the junk shops in town. There was no one to be seen! Around lunchtime we planned to make our way. The rain had other plans, and got heavier and heavier. We made a dash for Monteith’s brewery and despite it being only a few hundred metres, the pavement had turned to river and we were soaked. Luckily the brewery was everything we could have hoped and we whiled away the early afternoon with a tasting tray by the open fire. When the weather still refused to improve, we got more beer and chips. At about 3pm the sky cleared a little and we began our trail along the railway line following the coast. 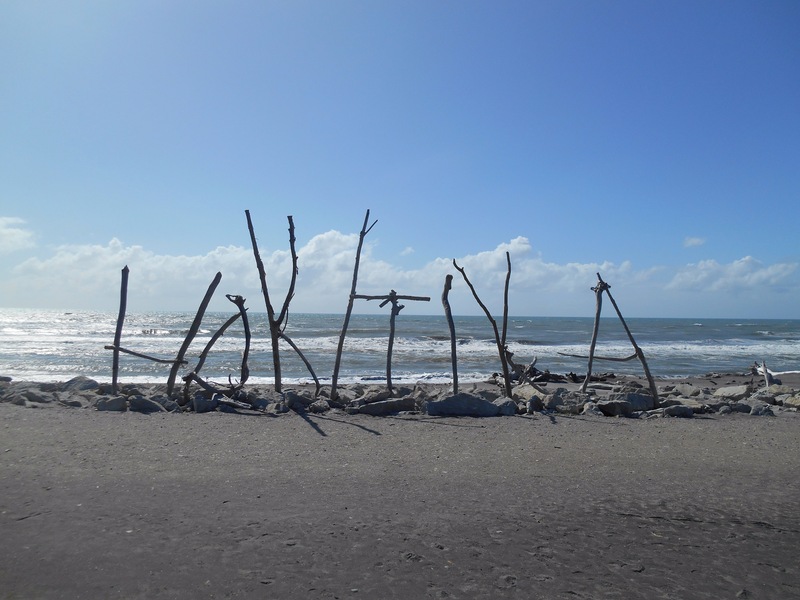 We circumnavigated the mouth of the river, literally, Greymouth, a hostile entrance where many boats have become wrecked. The water looked fierce but the sky was clearing and the gentle ride took us to Kumara junction, then jurked inland towards the township. We stopped for the evening just beyond on the banks of the lake and managed to put the tent up, cook and have a short read of Aladdin before the deafening rain began. Our tent held up well with only a few leaks which we figured was a problem for the morning, and went to sleep. We managed to pack up, diverting into the tent a few times between showers, and headed out for the next stretch of our journey, to Cowboys Paradise. The little path took us around and eventually across the lake, climbing then into forest and track. The peaks of the mountains in the distance were smudged, much like water spilt onto a canvas, blurring the dark shapes into grey cloud. The ride was supposed to take 6 hours, but a little after two, we emerged to Cowboy’s Paradise. 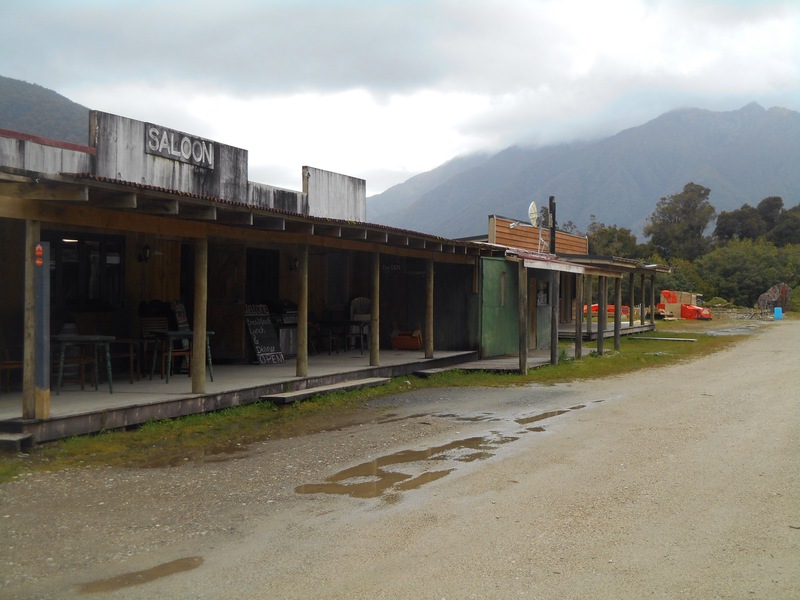 The town was marked on the map with a little food sign, and I have not come to expect much from Kiwi towns, however Cowboy’s Paradise may be the strangest little settlement I have ever seen. It was a dirt track which emerged with a wooden ‘saloon’ on one side advertising accommodation, food and shooting. The other side of the track were several disused wooden shop fronts. There was a large flag and that was it, less than 100 metres. Population three? As I waited for Alice to catch me a girl emerged from the saloon and invited me in. I told her I was fine, just waiting. Then a second girl came out to invite me in. When I told her not to worry she sat next to me on the step. Both girls were German, working there and I imagine very keen to chat with the limited thoroughfare. We chatted for 20 minutes or so before pressing on. I admire her greatly, 20 minutes was more than enough for me! That being said, the winding descent was beautiful and passed many cows and sheep. We followed the rather full and fast river to the road. Two sheep were on the wrong side of the fence and hearing my approach began to panic that they couldn’t get into the field. They ran and ran, me peddling into the wind and not being fast enough to overtake them. I must have chased them almost 5km from their starting point, occasionally launching themselves at the fence. 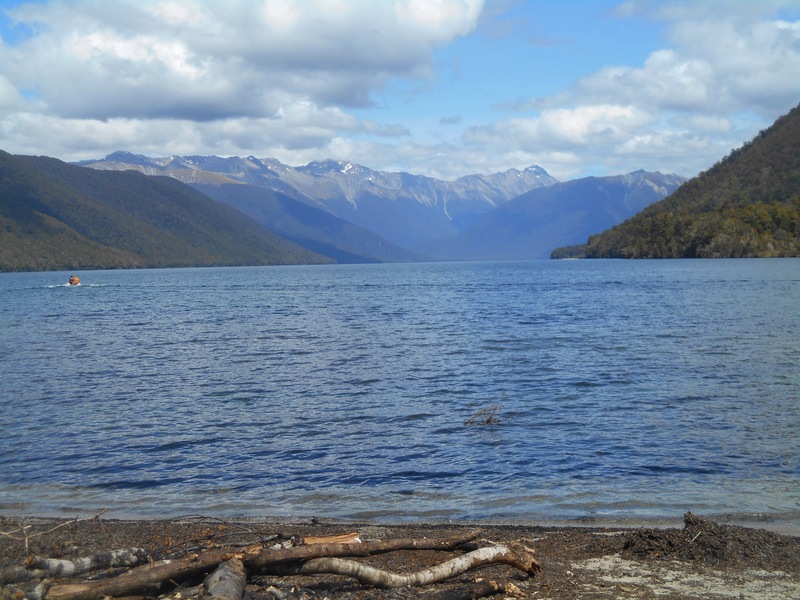 We stopped for lunch at Lake Kaniere and I began to unpack my soggy sleeping bag to make use of the sunny spot. I was joined by people from Israel asking about the trip and the bikes. When we were done talking he returned to his car and looked like he was going to offer me a biscuit, when more people appeared and began talking to me, in German until my startled face gave it away I wasn’t understanding. I am unsure where all the attention came from, or rather where all the people appeared from, although once we were alone Alice said she had been joined by a boy on a bike for 6km who was working out here picking moss. He had seen her and asked if he could ride with her to have someone to talk to. It’s places like this that turn you loopy. From the lake the track darted through forest and out to reveal the lake, then joined the road to the coast and Hokitika. 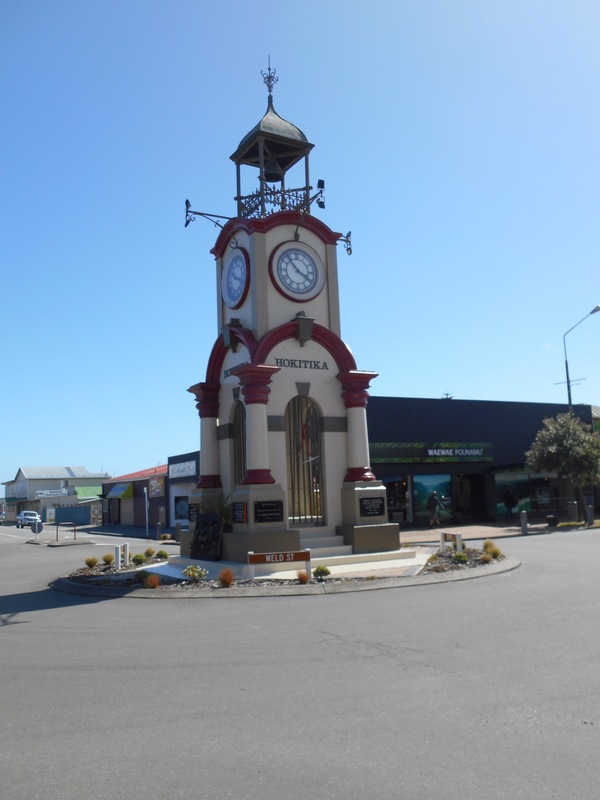 Hokitika was once a prosperous little town which during the 1860 gold rush boasted 102 hotels!! Now it is quaint and in the late afternoon sun, was a lovely place to get a nice cream and sit on the rather blustery coast. We showered and dried out the tent ready for the next dose of rain which on the west coast, I’m sure won’t be far away! After dark we went on an excursion in our pyjamas to the Glow worm Dell, a little walkway with mossy walls. As the light drew out of the day, the bugs lit up the path with their little glowing tails. Magical. Looks like you had a good mixture of the weather – typical at this time of the year. We say “don’t like the weather – then just wait 15 minutes……”. Incidentally Cowboy Paradise isn’t a town or even a settlement – private property that has allowed the cycle trail to run through. Used to be just a shooting range and would get corporate groups/weddings/birthday parties etc. It is now making the most of its location and cycle trail by providing accommodation and food to travelers on route. The German girls are “woofers” – stay for free in return for lodge and boarding and half day working – or something like that. Win win for everyone. 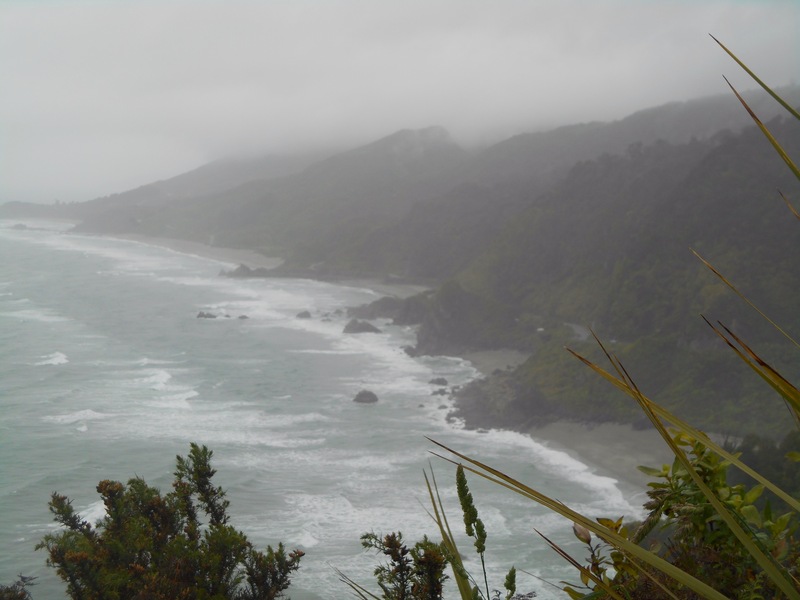 Hopefully weather didn’t hamper your efforts further down the coast – certainly looked like you had a good day in Hoki – I’m sure the ice cream was well worth it. Ah makes sense! Yes Hokitika is a quaint little town. We are enjoying ourselves on the wild coastline, and so far dodging the worst of the rain in cafes!